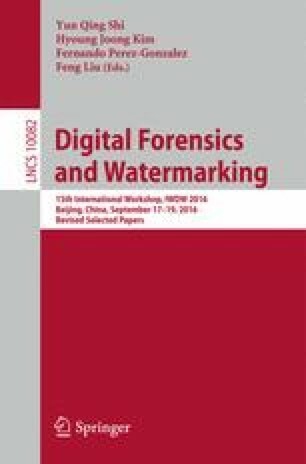 This paper proposes a technique that can protect the copyrights of digital content for 3D printers. It embeds the copyright information inside 3D-printed objects by forming a fine structure inside the objects as a watermark. Information on copyrights is included in the digital data for a real object before data are input into the 3D printer. This paper also presents a technique that can non-destructively read out information from inside real objects from a transparent image of the object using near infrared light. We conducted experiments using polylactide resin where we structured fine domains inside the objects. The domains have higher density than other regions. The disposition of the fine domains expressed binary code depending on whether or not they were at a designated position. The results obtained from the experiments demonstrated that the image of the fine domain inside the object can be captured by the near infrared camera and binary code could be read out successfully. These results demonstrated the feasibility of our technique showing that enough information can be embedded for copyright protection. This work was supported by JSPS KAKENHI Grant Number 15H02707.